The Abbotsford Heat, formerly the Quad City Flames and Ak-Sar-Ben Knights, are going to playing next season as the Calgary Flames affiliate. This past week, they put out their new identity which is something that was a change from the usual take the Flames jersey, paste a Flames-esque logo on the jersey, and play. Parts of that is true, but still. As you see from the new set, the logo itself at the top is kind of....meh. Of course, the assumption that the Flames would bring back the old Atlanta Flames "A" for the jersey would have actually made sense and move some merchandise for those who love that logo and look for the Flames. In fact, looking at the logo-- it almost looks like it's a logo from a lacrosse team. 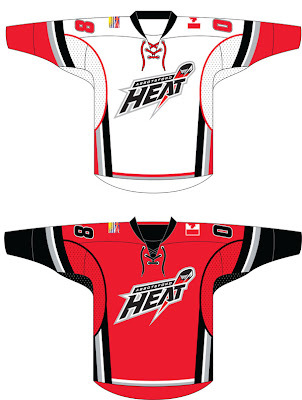 The jerseys are pretty much the Flames jerseys, but with the yellow in the Flames template being replaced with silver and the Alberta flag being replaced with the British Columbia flag, which make sense since the Heat will actually play in BC. I mean, I guess the scheme works, but you have to wonder....when has heat ever been silver?? I mean, I think heat, I think red, orange, yellow, and black as the aftermath. Maybe that's just me-- I'm old school like that. As a whole, it's something we've come to expect from the Flames when it comes to their franchise affiliate and having something to do with the Flames name. It's been very rare that the Flames have had an affiliate without the matching named. I would have loved to see the flaming "A" on the jersey with like a Flames' template motif, minus the black on it-- just to see how it could hold up, but it is not to be. Once they take the ice, it'll be easier to judge, but now we have just take from this hope for the best later. The Entry Draft has come and gone for another year and you can pick and choose who you want to say who picked well, who picked suspiciously, who may have given up too much, and who’s going to get the 26th pick this time around. However, this one thing I thought about was spirit of this whole thing, to steal a line from Charlestown Chiefs beat writer Dickey Dunn. History lesson: I started going to Drafts at the ripe age of 19 in Toronto in 2002. When I got there, it wasn’t that big of a festive thing. It just seemed like some people saw something was going on and glided into the Air Canada Centre just because they had nothing better to do. The next Draft in Nashville, I wasn’t expecting much under the assumption that because if a devoted hockey market like Toronto couldn’t get up for something, what would Nashville put out?? The Sommet Center was alive with fans, lots of reactions, lots of glamour, lots of just fun times by fans and media alike. Granted, after the Predators make their pick in the early first round, the mass exodus happened, but regardless—the thing was that they showed up and put Toronto to shame for turn out. The same went for Raleigh, Vancouver, Columbus, Ottawa, and this year in Montreal. 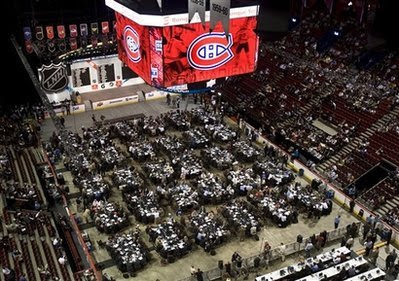 The energy in a place like the Bell Centre is amazing just to have that feeling for the pick they made (Louis LeBlanc), what is this place like when there’s a playoff OT winner?? Now you have blogs blowing up at a rapid rate, you have Tweet-ups going round and round in order to get more fans connected to each other, and you have everyone getting together for a somewhat common goal. The Draft is the perfect spot to do it because not only can you meet people in your own area, but you have those coming from all over the place for a vacation to meet up with and connect with. It could be a good thing or a bad thing, just depends on how you see things at the time. Plus, you while you have the host fans there in droves and cheering their team whilst booing their rivals, the hospitality from them are great wherever. It seems this could be the only time where the cease-fire of sort is put in place. People are at the bars drinking with each other, joking, drinking—it’s a fun time had by all until the bars close up and you go back to your homes, hotels, cars to sleep it up for the next day. It’s an event like no other for fans and seems to just grow building to building. You just have to hope that maybe, just maybe—it can keep the momentum up wherever it lands net year, which is still yet to be determined. While it’s a great two-days for those kids getting picked and taking the next step in their hockey careers, on a personal level, it’s a great day for fans because people whom they’ve only corresponded with on emails, message boards, blog post—they are meeting for the first time and putting a personal aspect to their comments, good, bad, and indifferent. It creates for a tighter knit community, a better understand of where people are coming from, and just how much they really know when they aren’t with their statistics in front of them. Plus, it may create a light-hearted atmosphere for even the most hardened of hard-asses. Good times for all, that’s for sure. Hey all, I'm here from Riser 1 with JonnyP making up Team Media Riser. I'll be tweeting thoughts on Twitter rather than do it on a live blog. Check me out there at Scotty Wazz's twitter. It's fun for the whole family.....or not. 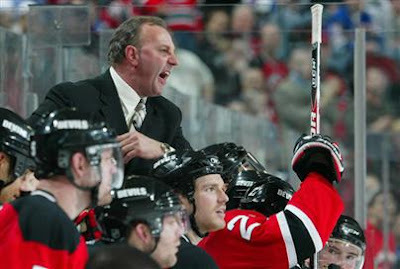 This is the lesson that Brent Sutter should have learned in his time in New Jersey-- you never go against the pizzeria or the family. With Sutter wanting to leave for "family reasons", everyone knew that after Mike Keenan was dismissed as Calgary coach-- odds were that he was going to head there to be with brother Darryl. Why couldn't he be upfront with people and be a straight-shooter and not try to pull the wool over people's eyes when it was blatantly obvious what was going to happen. Frankly, I believe this to be a bad move for the Flames. There's a need for a drastic change and I don't think that bringing in another Sutter could be the cure for what ails them. Sure, it's nice to see some kind of lineage there, but this could have been time for a change in thought, a change in appeal-- but alas, we have the same gimmick we've always seen with the Flames in the past few seasons. While Brent's numbers don't lie and his success at the junior level and to an extent when he was in New Jersey during the regular season is impressive, his inability to get the Devils out of the first round of the playoffs in each of his two seasons is something that should be disturbing to Flames' fans. Especially for a team who hasn't been out of the first round since they were in the Cup finals four seasons ago. Whether it's the players fault or the coach's fault is still something left up for debate, but the fact remains that Sutter's coaching record isn't that you would want to see when you need to get a team to that next level. However, the one thing that Sutter could be able to do is get Dion Phaneuf back to his old self which made him a top-10 pick in 2003. Phaneuf was coached by Sutter in his years in Red Deer and Sutter was able to get the most out of the hulking defenseman, which could turn out to benefit the Flames in one aspect. What Sutter could do with Jarome Iginla and Miikka Kiprusoff may be another tale, but one worth looking at right now. Yes, another Sutter in Calgary, which could be nepotism at it's best, but it is what it is. Once Sutter said he was leaving Jersey, fact of the matter is that regardless of how much he denied, regardless of his reasons-- WE ALL KNEW what was going to happen next. That mistrust to the Devils and Lou Lamoriello may cause karma to come back to Sutter in a bad way and be the worse thing for Sutter and Flames fans when all is said and done. Had he been up front, I'm sure people would be more forgiving and allow this be the course of action; but to claim family reasons and that reason being he wanted to coach next to his brother the GM, that's a tad underhanded and a bit classless. However, when all is said and done, should Brent fail-- there's 150 other Sutters who could be the next in Darryl's holster to take over for Brent. Of course, this assuming that Darryl would still have a job. This may be Darryl's last gimmick for the Flames and should this not pan out-- it could be curtains for the Sutter regime in Calgary. The #Habs need a Defense coach now & Chelios was let go by the #RedWings - How about player/coach Chris "Reggie Dunlop" Chelios? Now, how far-fetched is that?? Are we at the point where we have guy who are not going to give up, so we may as well give them a coaching spot in the process to ease them into the transition of the post-playing life?? Now, Tyler said that he's joking, but at the same time-- I believe this to be a very true possibility. In fact, Chris Chelios actually created the thought of a coach behind the bench instead of on the ice when hockey first started.....true story (to steal an O&A bit; Linger Longer). Of course, if Chelios can still play; it's not a bad idea to have him in an increased role on the team and teach some of the younger kids the small nuances of the games and position, as well as tell them about how the phonograph became so popular and how he doesn't get this new fangled iPod stuff......okay, a reach. Anyway-- you sign the guy to the league minimum and you can utilize him as a player or as a coach when/if he's injured or too tired to play. Granted, if you're the head coach of any team, you don't want to see this. That's an awkward position to be put into as a coach to say to a guy that he's not good enough to play, but how about you stand beside me on the bench and watch the guy who is taking your spot do better than you. It seems like putting salt in the wound to make this guy watch the man taking his spot. Think of the tension that it could create through the lockerroom if that were to happen. Although, you never know if Chelios has resigned to the fact he's not going to be able to keep up with the speed of the league and may have to take this option to play some rather than none at all; though I doubt his pride will let him do that until it's the last ditch effort. This has been able to work before in the lower-minor leagues, but I doubt it would fly in the NHL. 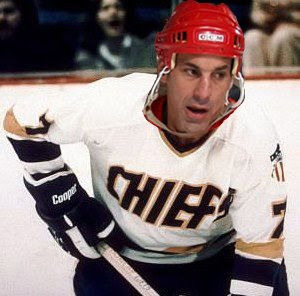 However, if there's ever one guy to do it-- it will probably be Chris Chelios. The last player-coach in the NHL was yet another seasoned defenseman, Doug Harvey-- so history could be kind to Chelios. Yet, like Tyler-- I doubt any of this will happen, but it may be nice to see someone carry on the Reg Dunlop tradition for a new generation that may only know the "Slap Shot" heritage for the Hanson Brothers, Stephen Baldwin, and awfulness. By all accounts, John Tavares will most likely go #1 Overall. He seems to be the best player on the board, with the hype in full effect to help him out. Everyone seems to believe that he's the guy to go after since the Islanders need a big boost in order to get them out of the dregs of the NHL standings. But they aren't going all out by saying they'll pick-up Tavares, even insisting that they may go with the Swede Victor Hedman. Of course, the wily Matt Duchence has been mentioned as a darkhorse candidate for this #1 overall spot. But is that such a horrible idea to keep people guessing?? Especially with the knowledge that a team like the Tampa Bay Lightning need a player like Victor Hedman on their blue line to maybe turn the corner. Plus, what will the ripple effect be if Duchence or Hedman goes before Tavares, how many strategies change, how many teams start to phone up the Bolts to see what they want for their second overall pick?? Does that make the second overall pick the most valuable in this whole draft?? 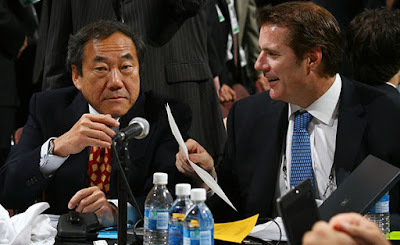 Good on Garth Snow and Charles Wang for keeping their ideas close to their chest and making other teams work out scenarios in their head and working out what to do and what to offer in different situations. To be honest, how could you go wrong with any pick out there?? Tavares a total package that has been talked about for the past three years going in this positions, Hedman is a man-child who has the size and ability to step in tomorrow and head-up the defensive corp, and Duchence is an underrated player who has the skill set and all-around play that could make him beneficial to the future of an organization. Many speculate that Duchence could be picked because the Isles like what they see in him and think he could be more willing to play in Long Island than the other two. If you're playing the odds, the Islanders would be best going with Hedman, as there hasn't been a big defensive bust since the Bruins picked Gord Kluzak in 1982 as their 1st overall pick. Of course, Kluzak's injuries were his downfall and he holds the distinction for playing the least amount of games for a 1st overall pick pre-2000 with 299 games played. Though, it seems that the defenseman spot is due for a downfall, you wonder if picked-- would the Swede be in line for a disaster, much like Kluzak who was a big, hulking defenseman (like Hedman) when he was picked. Well, it's going to have to happen first for us to get a true gauge. Yet you have to like the secrecy, the tight-lipped portion of it all and keep it all in house until it's time. You can't really see a downside to it, because it keeps people guessing, keeps people on their toes, keeps the kids wonder and worry in anticipation. It's not a boring sure thing, which is nice at times-- but to keep the media and fans on their toes is an act of showmanship by the Isles and they could use all the attention they could get at this point. We all know about the 2010 Winter Classic all but certainly going to Boston's Fenway Park with the Bruins taking on either the Washington Capitals or Philadelphia Flyers. 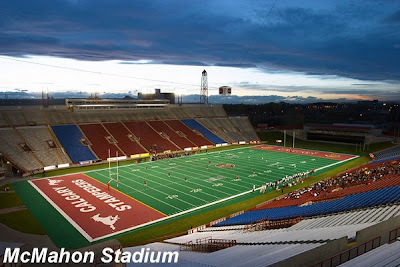 However, there seems to be not so much competition for the site, but a partner for the site as EJ Hradek first broke that the Calgary Flames could be playing a Winter Classic game at McMahon Stadium against another Canadian team. First, I'll get my hopes up that this is true and that living in Calgary may pay off in this instance. If this does happen, you can bet I'll be trying to get some kind of entry into this, whether it be for press credentials or overpaying for a ticket, but somehow-- I'll try to get into this game. Now, with that out of the way-- I have to say that this may be pushing the envelope of making this gimmick tolerable. The magic about the Winter Classic is that it's something that is/was exclusive to one game and two teams. If you try to throw a second game in there, doesn't it take away from the prestige of the whole thing?? You would think that if the NHL wanted to show off the game and make it special-- why can't you keep it at one game?? I know that this could be the ploy to not exclude the Canadians to this whole thing since there hasn't been an outdoor game in Canada since the Heritage Classic in 2003. Add this to the Montreal Canadiens saying they want an outdoor game-- this could be a disaster for the uniqueness of the game format. Plus, while a game in Calgary could be nice-- the problem is that it could be anywhere from -40c/f or +14c/57f in these crazy weather times in Calgary-- it snows in June here for pete's sake. Of course, the former is more likely, which could turn into a bad thing for fans and players alike....because that's damn cold, I don't care how tough you are. I know a lot of players weren't too pleased when they had to play in Edmonton in those freezing temperatures. The case could be the same with this ordeal, if the weather is just right. Sure, it just adds to the tradition of the thing, but still-- there's a line you don't need to cross when it comes to player's health so they don't get some kind of hypothermia. Sure, that's an extreme, but should not be discounted. If you try to overuse a gimmick, it will grow stale, it will get old, and it will not be as profitable anymore. Sure, everyone wants to see and play in an outdoor game, but if you overdo it, you'll get sick of it and want them to stop it. It's just nature of the beast and something that goes with anything in this world. The NHL needs to take heed and realize that maybe you can get too much of a good thing. Mark my words, Jim Balsillie will come back and will not rest until he gets his team. The moxie that he possess is something that draws me in, especially when you see guys who could care less about owning a hockey club; Balsillie is a breath of fresh air. Though, his own downfall is being too anxious to own a team and usually ruins the deal by being overly aggressive. 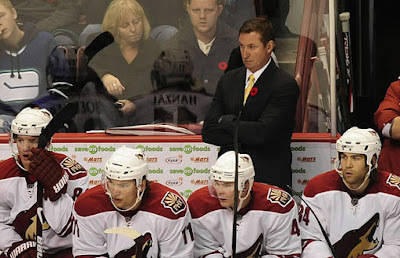 That was the case in the Phoenix Coyotes' case mostly due to the fact that the time line he put out there for a team was much too short to sort things out. However, Balsillie is getting closer and closer to getting it right, but no cigar just yet. Frankly, had Balsillie been a little more leinent with his time line, had he been more flexible for when he wanted this to be solidified, then he probably could have gotten his team and maybe been able to move them to Hamilton. However, strong-arming the system doesn't often work out to be the best way to go about things. You have to wonder though, if the Balsillie camp will throw their hat into the ring to re-bid for the Coyotes now they could be purchased by anyone right now. If he doesn't get back into the Phoenix gimmick, you can bet there's some owners out there that will be willing to listen to Balsillie's pitch if they are in trouble enough. The Panthers have had interests from some former baseball players, but those buyers may or may not actually be getting into the game. Plus, with Charles Wang having his regrets buying the Islanders and having issues with getting a new arena, you know that Balsillie may have been put on Wang's speed-dial now that he's a free agent prospective owner. If Balsillie can calm down a little bit on his anxiousness, if he can be able to actually go somewhat by the way of the law, he will be fine. He got closer this time by going that route rather than the tactics he tried with the Penguins and Predators in the past. Maybe he just needs to get away from the letter P in the alphabet to be successful, since it hasn't worked for him thus far. Yet, this is another learning experience for Balsillie and his Make It Seven campaign was amazingly put together and got support very quickly and very noticeably. 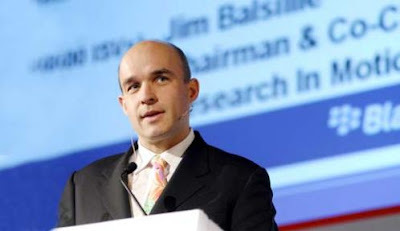 Balsillie is a great marketing man and a solid businessman. Right now, he just needs to have the patience to get things through to get an NHL team and he'll be perfectly fine. I will make this prediction, which could be considered bold or obvious-- you be the judge: Jim Balsillie will be back and he will own a NHL franchise when all is said and done. Coyotes Survive, But For How Long?? The Phoenix hockey fans got a small reprieve by Judge Redfield T. Baum saying that there wasn't enough to sort out all the legal issues before Balsillie's June 29th imposed deadline. I'll have more on Balsillie coming up later on in the week, but the fact of the matter is that Balsillie's overanxious nature to get another team in Canada is his more endearing quality, as well as his greatest enemy. In any case, it's now time for the NHL to step up to its promise of having four bidders ready to buy the team and keep them in Phoenix. Gary Bettman and the league's legal team made a big deal about having other interest ready to keep the team where they are at. If these bids don't come down as the best for anyone-- who is to say that it's going to work out in the end. Plus, if there is a bid and the team doesn't get any better and the team continues to hemmorage money-- who's to say we won't be in this situation again five years down the road?? The thing with the Balsillie bid is that it was going to recoop most of the money that the was lost by the creditors. What's to say that these bids that have been talked about and have been flaunted by the NHL are going to be up to that kind of snuff or if they are actually going to relieve anyone of their financial heartache they suffered from the investment into the Coyotes. One of the more interesting quotes or implications from Judge Baum when it came to the other offers is that with no firm offers being out there for the team, he dismisses the bids are hearsay and may or may not even happen in the end. So, let's say now that these bids that the NHL has made up these stories about these bids, what if there's just been guys sitting around the bar, sipping martini's saying, "Hey, if I bought the Coyotes, I'd keep them in Phoenix", to which the NHL spy took that and ran with it saying they have the money and willingness to keep the team in Phoenix. Truth be told, if there are no bids on the team by any of the suitors the NHL have said there were, how can we even believe that any of these guys had an interest to keep the team in Phoenix, much less keep the team period?? Maybe they had an interest until they saw the books and projections for the Coyotes and then started to back away slowly from it all. All the fans know is that it seems everyone is chomping at the bit to buy a team who has lost more than $300M in 13 years and keep them in their current enviroment. See how crazy that sounds?? So, here we are pretty much the same way as we started. The Coyotes are still in financial trouble, the NHL still promises a white knight to come for the Coyotes and yet no one has stepped solidly to the plate for them, though apparently they are out there. 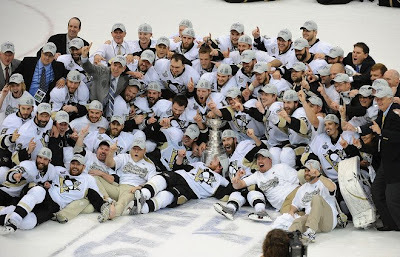 Though one could say that you can buy a team that has its financial woes and turn them into a big money maker, like the Cup Champion Penguins-- but thanks to good management the Pens were able to be built into a champion and get a wealthy investor to believe in them enough to pony up money for a new arena. I don't know if there's anyone who has looked at the books and thought this was still a solid investment when all was said and done. This Coyotes' situation is far from over, but if what the NHL says is true-- expect bids to pick-up very shortly.....because the league wouldn't want to lose face by not delivering on some promises, right?? Now that we're done with the Playoffs, we have three things to look forward to. First, the farce that is the NHL Awards show in Vegas, no less. Third, the Free Agent Frenzy that'll happen on July 1st, but we'll talk about the second part now-- the NHL Entry Draft. We'll have all kinds of mocks, but this right here is my final Mock Draft leading up to the June 26th Draft. Now, clarification when scoring-- and I don't mean at home. I'm pretty much drafting for position, not so much team. Sure, I'll put why the player would be an asset to the team, but if he lands in that same slot to a different team-- I'll claim victory. I'll also claim victory if a team moves up and picks the player I had them with. Example: If say the Winnipeg Jets were slated at 20th and I had them picking John McHockeystrom (patent pending), but the Jets trade up to 11th and still pick McHockeystrom-- big in. That's one of the many things that the Penguins can take away from this season, this series, this year. From a team who looked dead in the water in February, once coaching change, a couple of trades, and this team is Stanley Cup champions. Plus, if nothing else-- Sidney Crosby gets his Stanley Cup, while the NHL and Reebok reap the benefits of him lifting the Cup. Next season may see some minor changes for the Penguins. First off, you can imagine Petr Sykora, Bill Guerin, Miro Satan, and Ruslan Fedotenko may not be back next season, though Fedotenko may be one of the few who comes back out of the four. Plus, not to worry for the Penguins, who have one of the best one-two combos in the league in Crosby and scoring champ Evgeni Malkin in their line-up. Sure, the secondary scoring will be an issue, but Jordan Staal, Maxime Talbot, and Tyler Kennedy showed signs of scoring savvy in these playoffs and many Pens fans could hope that they can continue that into October and next season. Defensive defense is a weak point for the Pens, with Kris Letang and Sergei Gonchar leading the rush more often than not, but the key here is whether or not they will be able to get their top defensive d-man, Rob Scuderi under contract at a reasonable price. Scuderi's stock rose through these playoffs and could be best known for the big stop in Game Six, which gave the Pens the win, for the most part. I'm sure Ray Shero will be able to talk to Scuderi and make him buy into the system and stay with the team. However, you can wonder if there will be a big push to retain the services of Hal Gill (probably not) and Philippe Boucher. In net, M-A Fleury bounced back big time from the Game Five shelling, and won two big games in Six and Seven, with a huge save at the buzzer in Game Seven to capture the Cup. While the future of Fleury is not in doubt, who will back him up is another question. Mathieu Garon is unrestricted and you wonder if he'll be brought back or if they'll let John Curry to be the back-up for Fleury. Last year was a start and while the parallels are being drawn to the 1984 Edmonton Oilers Cup team are being drawn and the talk of a dynasty is being brought up-- it's almost a bit of putting the cart before the horse. Let the kids cherish it now and worry about next year in October. It's hard to keep your core together when you have a salary cap to deal with, but let them savor the flavor now, and worry about the future when it comes. 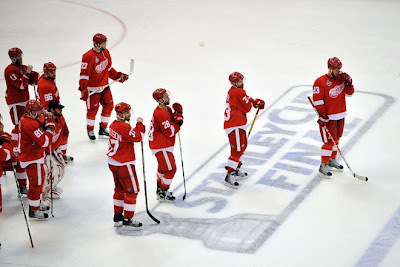 They were one win away from Back-to-Back crowns, but the fuel in their tank was on empty and not even their depth to take them to raise the Cup once again, but the Red Wings really have nothing much to be ashamed of when all is said and done. A lot of the same people in the line-up will be back for next season. The one big question mark will be what to do with Marian Hossa. While somewhat solid in the regular season, Hossa seemed invisible in the playoffs, especially in the Finals, when he needed to redeem himself the most. Considering the Wings are going to be tight to the salary cap as it is, will they be willing to shell out the money to keep Hossa on the squad, knowing what he's capable of in the grand scheme of things. Luckily, Henrik Zetterberg is locked up, as is Pavel Datsyuk, both you can bet will be even hungrier than this year to prove themselves. You have to wonder with the play of Justin Abdelkader will allow the Wings reason to let Hossa test the market. Defensively, the question is what's going to happen with Nicklas Lidstrom. While he does have one more year on his contract, you have to wonder how much he has left in the tank. Lidstrom is 39 right now and may have enough left for another season, but how much further he can go and continue to contribute is another story. Luckily, Jonathan Ericsson stepped up in the playoffs to show he could carry a significant workload if called upon. Goaltending, Chris Osgood was up-and-down during the season, but came up to be a crucial role in the playoffs for the Wings and showed that he really could be a top goaltender, even with talks of Hall of Fame. Of course, odds are Jimmy Howard will be called upon to be the back-up to Osgood. You can pretty much expect Ty Conklin to walk away, as to not hinder Howard's confidence or that of any other goalie who could be the possible back-up, which could come in the form of Thomas McCullum or Daniel Larsson. While the depth is there for the Red Wings, it's a matter of putting it to good use and being able to roll over the talent seemlessly as they have been able to do in the past few years. It wasn't meant for back-to-back, but who knows if we can see them pick up the 35-pound silver grail next season. It's a very high possibility given what we saw this post-season. Emery + Philly = Phantastic?? The Philadelphia Flyers made their goaltending issues a little bit clearer....or blurrier, by announcing Ray Emery has been all but signed, sealed, and delivered to the team for next season. Emery, of course, was formerly of the Ottawa Senators and then took a Russian vacation this past season and did reasonably well, going 22-8 with a 2.12 GAA and .926 SV%, which got him a job back in the NHL. Now, before we get to outside the ice, let's get to on the ice. With Emery in, you can see the writing is on the wall for Martin Biron, as he would probably not want to sign for less and sit behind Emery on the Flyers' bench. Emery has the ability to play well when he wants to and when he's healthy; but his last tenure in the NHL was horrid with the Senators and got him bought out by the Senators. We'll see how his vacation in Russia did for him, but it looks like he may have gotten back on track with his play and his abilty to actually win again. However, the main concern could be what happens off the ice, especially in a place like Philly. If he starts to slump, you know that fans in Philly will get on him and get on him like no other fans could. You have to wonder what could become of his psyche if Emery does flop on expectations made. We've all known about his troubles in Ottawa, both from the team and from the Ontario Provincial Police (yeah, you know me), plus the flare-up he had in Russia when asked to put on a hat. You wonder if he's settle down a bit or if he'll flare-up big time in place that's very unforgiving. The hope, of course, is that Emery will play well in his one-year deal and then sign a long-term deal and bring some stability to the Flyers goaltending, which really hasn't had a solid starter since maybe Tommy Soderstrom. We'll have to play this by ear, but starting July 1st, when Emery can officially sign, the Razor Era begins in net for the Flyers. The heat for a second team in the Greater Toronto Area is going strong, with a group putting forth their plan for an expansion team in Toronto. They have plans for an arena, ticket plans, and a name with logo and jerseys already. That's right-- the Legacy is in plan, apparently, for expansion consideration. They have a website and everything, too. I'll get to the aestethics in a second, but the proposal is a little bit head-scratching in some parts when you look at it. First off, the fact they're going to built a 30,000 seat arena and expect to fill it night-in and night-out, which could be a little outlandish if the economy continues to be this craptastic. Yet, it seems that there's reportedly $1 billion (CDN) is already ready to go ahead with this whole thing, all in private money. Don't know if it's unmarked, unsequential bills....but we'll find out in time, I'm sure. Another thing is the timing of this whole ordeal, with the NHL dealing with Jim Balsillie trying to get the Coyotes to Hamilton-- they don't need this thing in their mind as well. The NHL has stated they have no plans of expanding. Andrew Lopez, who is the head of this venture, has said that if the NHL says no-- this plan is dead as dirt....which is silly to roll out this whole thing, create a big swaray, and make a huge headline.....then to abandon it just like that. Since Lopez hasn't talked to the NHL yet, you can be assured that they'll shoot this down fairly quickly. Personally, this reminds me of Jim Balsillie trying to get his foot in the door with the Penguins and Predators; not having the approval of the NHL first may be the worst thing you can do and Lopez may soon find this out. Now, onto the name, logo, and jerseys...which...oof-ta, as the kids may say. First, the name-- I think that the WWE could be suing for naming rights. However, the name is not that intimidating, unless you're going out for a fraternity or sorority-- that's when a legacy gets a little scary. The logo (as seen above) is decent, but pretty busy. It's simple, but complicated-- with the Toronto skyline being the thing that clutters up the whole ordeal. Also, the stripes are a little much, especially for a Canadian team. The jerseys they brought out (seen below) are nothing special, but could work with the basic feel. 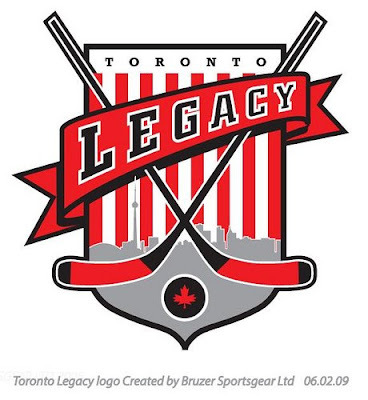 So, yet another group is putting the cart before the horse in terms of trying to get not only another team in Canada, but another team in the GTA. The Leafs, of course, won't like this and will fight it to the death-- but I think this threat isn't going to be as strong as the one they are facing in Balsillie. Yet, I don't think that these guys coming out of the woodwork with their ideas to get a team back in Canada, especially when there's issues abound elsewhere. If anything, the NHL is going to be stricter when it comes to the proposals put forth and probably have the kibosh be put on them quicker than usual. 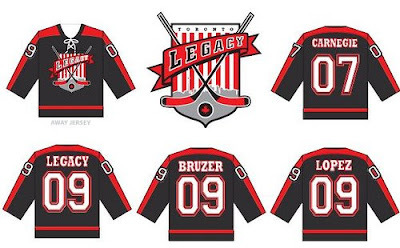 However, best of luck to the crew trying to get the Legacy idea off the ground, though I think it's in vain. I preference this by saying this is not a dig against the Penguins and their fans, but a venture into why something like a white out won't work and why it shouldn't go to anyone outside of Manitoba. 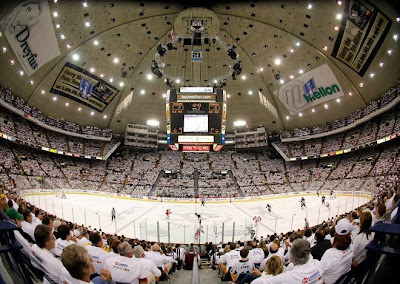 As we all know, the color-coated themes by fans in the playoffs-- Calgary's "C of Red", Washington's "Rock the Red", Philly's "Orange Crush", and the Islanders "Navy (First) Overalls"; but the one big thing that irks the hell out of me is the "White Out" in Pittsburgh. It's not so much the sacrilegious part of it by taking a hallowed gimmick by the Winnipeg Jets (may they rest in peace), which actually had a meaning to it and had legs throughout the entire hockey community. Sure, other hockey teams and college teams have tried and this and it has worked out for the most part because that's how most fans roll, but the Penguins thing irks me more than anything and here's why. My complaint is the Penguins don't even wear white at home anymore-- and haven't since the '03-'04 season-- so why wear the white to the games?? The colors of the Penguins are fairly unique to the NHL, with the Bruins having the only close scheme to them. Why not do something with the black, which is a little hack, sure-- or the Vegas gold they have?? You'd think a team would think outside the box and not steal material like they were Carlos Mencia....allegedly. You'd think that the road team would try to convince themselves that the white-out was for them, since they are in white while playing, and hype themselves up that way. Fact of the matter is this-- don't take a great hockey tradition that was enstilled by a dead franchise and try to make it your own or say it's an homage. If you want to be original, so something that's going to put your own stamp on it and going to make you stand out. If I'm a Jets' fan, the white-out is sacred and while it's understandable that the Coyotes did it when they got into the playoff, it's still hurt to see something that was tradition move away from your area. The Penguins doing it must be 1,000 kicks to the groin with Jets fans seeing it. So, note to the Pens and Pens fans-- let's buck the hack trend of unoriginality and maybe do something to put your own seal onto something you'll be doing year-in and year-out. You have a good team and good color scheme to do something spiffy-- make it happen.